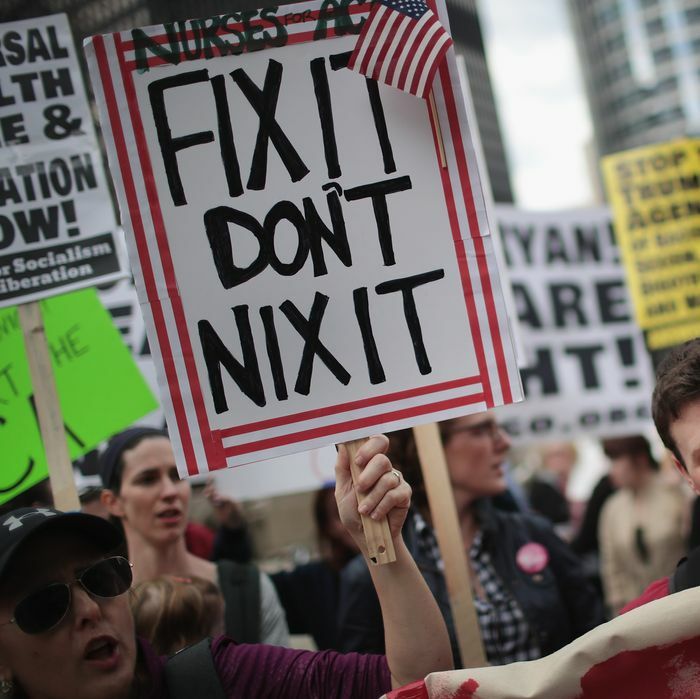 Demonstrators gather in Chicago to celebrate the initial defeat of the House Obamacare repeal bill on March 24, 2017. At the end of July, Obamacare as we know it was saved when Democrats and three Republican defectors voted against a Senate bill that would have taken health coverage from millions if enacted. Then lawmakers went home for a long recess, drastically increasing the chances that those buying insurance on the individual market will face huge premium increases in 2018. Multiple experts have confirmed that despite what President Trump says, Obamacare isn’t actually “imploding.” But Obamacare enrollees may see their premiums increase by double digits next year, largely due to the uncertainly caused by the GOP’s effort to gut the law. With Republican lawmakers still teasing that they’re looking for ways to repeal Obamacare and Trump toying with the idea of cutting off cost-sharing reductions — the payments that offset the cost for low-income enrollees — insurers still don’t know how to price their plans for next year. Some insurers offered two rate requests — one if CSR payments continue, and a higher rate if they’re cut off — but the 29 states that use the federal exchange are supposed to submit their final rates on August 16. With the fate of the U.S. health-care system still up in the air, on Friday the federal Centers for Medicare and Medicaid Services informed insurers that they’re giving them a three-week extension … which probably won’t do anything to prevent massive rate hikes. Insurers now have until September 5 to file their final rate requests, the same day Congress returns from recess. There’s been talk of a bipartisan Obamacare bill that would remove Trump’s ability to take away CSR payments, but even if it has enough support, it’s not going to sail through the Republican-controlled Congress on their first day back. It is possible that the extra three weeks will tell insurers they should be jacking up rates. In May, the Trump administration was granted a 90-day delay in the lawsuit over whether it will continue making the payments. On August 20, the White House could ask for another extension, or it could drop the appeal, ending the payments. The next round of CSR payments are due the next day, and regardless of the deadlines in the suit, Trump could announce he’ll drop the appeal and refuse to make the payments at any time. Teresa Miller, Pennsylvania’s insurance commissioner, said that in her state Obamacare is stabilizing, not failing, and the new deadline “will give us more time to lobby the federal government to give the market certainty. A little more time will give us time to explain further how critical it is to get assistance to get the market to stabilize.” States and insurers have been saying that all along, so it’s hard to see what difference another three weeks will make. By simply announcing their intentions, Republican lawmakers could save Americans from the skyrocketing 2018 premiums they’re ostensibly so worried about, but instead they’re giving Obamacare a few jabs after the clock runs out.